Anyone who has experienced neck pain knows it’s no walk through the park. Whether it’s been brought on by injury or long periods of improper posture, consistent neck pain is extremely uncomfortable, puts a damper on accomplishing daily tasks because of limited movement, and worst of all it can progress into headaches, known as cervicogenic headaches, caused by stiffness and irritation in the muscles. That’s why taking on neck pain and establishing a form of relief as soon as possible is the best way to avoid problems from getting worse. Outside of pain prescriptions and important advice from your doctor, there’s a way to further your efforts in banishing neck pain for good. With any pain related issues, people cringe at the thought of exercise but seeing how the head and neck is supported by many muscles and ligaments, when they’re out of alignment and balance, it puts more stress on the body. Yet when they are in balance, it minimizes stress and tension which ultimately means less pain. 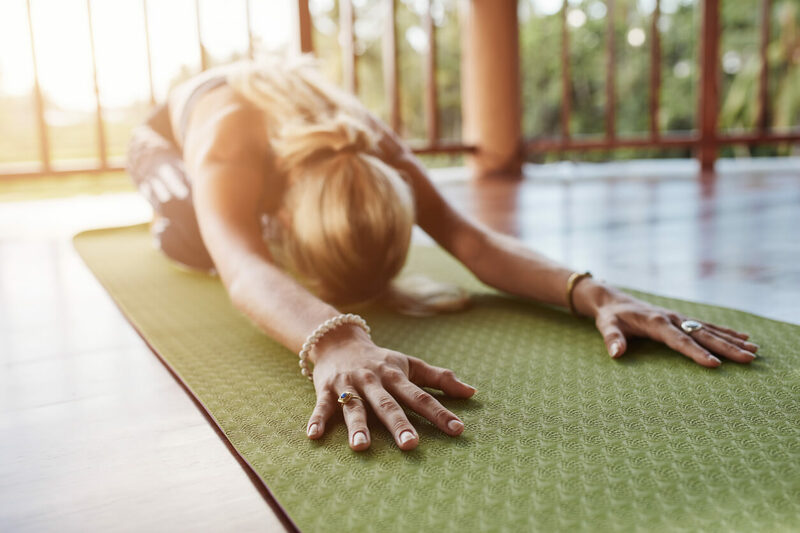 Check out these easy exercises and stretches you can do at home or anywhere you can stand, sit, or fit a yoga mat and work your way to achieving neck pain relief! When weaning your way back into having comfortable movements and full range of motion, it’s important to begin with something as simple as a nod. Start off by slowly lowering your head as if you were nodding “yes.” When you feel the front muscles of your neck contract, stop and hold for five seconds, then relax. You can complete as many as ten reps depending on your comfort level. Head rotations are another easy exercise that assist in regaining control of deeper muscles in the neck and aiding in faster pain relief. Gently move your head from one side to another, lining up your chin with your shoulder and looking in the directions you’re turning. Next, tilt your head from side to side. Again, ten repetitions are best. When it comes to easing any tension in the upper portion of the shoulders and lower neck region, this is the perfect go-to. Lay down on your left side and retract the right shoulder-blade towards the middle of your back in a slow rolling motion, hold for about five seconds and then relax. After about ten reps, switch sides. Kicking things into a more active gear, engaging in an exercise like the standing forward bend assists in helping your realign your posture as a means to relieve any unnecessary tension. Begin by standing with your feet apart, keeping them in line with your hips. While exhaling, bend forward, bringing your hands to your ankles, chest to thighs, and tucking in your chin. Next, inhale as you lift your torso halfway up and place your hands on your knees. Finally, bring yourself back to the starting position and repeat up to four times. This pose is excellent for side to side flexibility. Begin in a seated position on the floor and bend your right knee, placing your right foot over your left leg. You could either keep your left leg extended or curl it like you would in a cross-legged sitting position. You want to place your right arm on the ground behind you and wrap your left arm around your right leg. Then hold for around five seconds before switching sides. Stress in the shoulder area can contribute to neck related pain, so it makes sense that stretching out the deeper shoulder muscles will help alleviate any discomfort and this pose does just that by creating an opening in the upper arms. While kneeling, bend your right arm to where your hand falls between your shoulder blades, then bend your left arm across your back, allowing your left fingertips to embrace the right ones. Stay here for about eight to ten seconds, then do the opposite. Another great exercise to get you feeling your best is transitioning from cow to cat poses. Start by kneeling on your hands and knees, keeping them aligned with your shoulders and hips, and maintaining a tabletop position. On the inhale, lift your chin and chest while dropping your stomach toward the floor and then when you exhale, slowly arch your back. By engaging in this exercise, you fully stretch out and open up the neck muscles. Perfect for relaxation, the child’s pose is a simple, restorative yoga move that will surely bring you pain relief. Getting on all fours like the cow to cat exercise, bring your hips back towards your heels and keep your arms outstretched in front of you. Lower your hips as far and as comfortably as your body will allow and rest your head between your arms with your forehead on the floor and simply relax. You can hold this pose anywhere from thirty seconds to a couple of minutes. 9.) Legs Against the Wall. This is an all-around beneficial stretch as it releases pressure in the neck, aids in circulation, and relaxes the mind. First, you want to find a wall in your home that is free of shelves, paintings, or anything else that could fall on you. Then, with your knees against your chest, you need to position yourself as close to the wall as possible before rolling on to your back and stretching your legs up against the wall. Extend your arms to the sides and relax your head and neck away from your shoulders. You can remain here for anywhere between five to ten minutes. Lastly, we have one of the most beneficial and relaxing poses out there as it is a restorative yoga technique that helps bring peace to the body and mind. Adjust yourself in comfortable, flat position on your back, stretching your legs out on the floor in front of you and relaxing your arms at your sides. Now all you have to do is close your eyes and just breathe for five to fifteen minutes. As you can see, targeting neck pain with these simple, beneficial exercises will have you moving around with ease and feeling your best in no time. For more information on alleviating pain, be sure to visit our blog!